It was long thought that methylation, a crucial part of normal organism development, was a static modification of DNA that could not be altered by environmental conditions. New findings by researchers at the Salk Institute for Biological Studies, however, suggest that the DNA of organisms exposed to stress undergo changes in DNA methylation patterns that alter how genes are regulated. 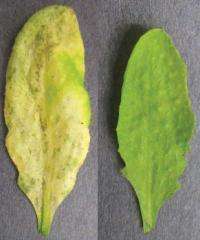 The scientists found that exposure to a pathogenic bacteria caused widespread changes in a plant's epigenetic code, an extra layer of biochemical instructions in DNA that help control gene expression. The epigenetic changes were linked to the activity of genes responsible for coordinating a plant's response to stress, suggesting that the epigenome may help organisms develop resistance to pathogens and other environmental stressors. "This means the epigenome may not just be a static set of instructions, but also a way of rewriting those instructions based on experience," says Joseph Ecker, a professor in Salk's Genomic Analysis Laboratory, who led the research team. "Our findings, combined with other researchers' findings, build the case that life experiences leave an imprint on our DNA." In the study, published online June 25 in the Proceedings of the National Academy of Sciences, Ecker and his colleagues studied how DNA methylation regulates the immune system of the Arabidopsis thaliana plant. Methylation is a biochemical process that, among other things, suppresses the expression of "jumping genes" called transposons that have been incorporated into the genome over time. Using genome-wide sequencing technologies, the researchers found a wide range of methylation changes in the plant's response to a bacterial infection and performed a variety of analyses to determine how these methylation changes alter gene expression. "From previous studies, we know that the expression of a few genes is coupled to methylation changes in response to stress," says first author Robert Dowen, who worked on the project at Salk with Ecker and is now with Massachusetts General Hospital in Boston. "Our findings, however, show that exposing a plant to stress triggers a multitude of methylation changes that help the plant defend against invading pathogens." Plants use a sophisticated series of defense mechanisms to restrict the growth of parasitic bacteria upon infection by stimulating various hormonal signals that trigger alterations in gene expression networks. The Salk findings and other recent studies suggest that these cellular defense responses engage the DNA methylation machinery to impart control over gene expression networks. Epigenetic changes in the genetic material, including changes in DNA methylation patterns and modifications to histones (proteins which play a key role in gene regulation), can alter the expression of a gene without changing its DNA sequence. In addition, molecules called small interfering RNAs (siRNAs) are intimately connected with DNA methylation, especially at the jumping genes, where these siRNAs direct the methylation process. Surprisingly, the researchers found that the levels of these siRNAs also change during infection at specific transposons and correspond to activation of these mobile DNA fragments. These findings illustrate the dynamic nature of the epigenome in response to stress. The Salk findings may have broad implications for agriculture, including engineering the DNA methylation patterns of plants to generate pathogen-resistant crops and minimize pesticide exposure. These application technologies are of intense interest, as more than 30 to 40 percent of annual crops are lost to pathogens each year at a cost of some $500 billion. A recent study published in Plant Physiology suggests that memory of environmental conditions may be passed transgenerationally, as plant defenses are primed in the progeny of plants whose parents have already been exposed to pathogens. "While this phenomenon is poorly understood, it is of wide interest and is being intensively studied in the field," says Dowen. "We think our findings may provide a framework for directly testing whether the methylation changes that we observed are passed to the progeny or whether a similar mechanism may be occurring in human cells." cool stuff to learn about. stuff my hort college at the uni didn't go over.